Aussie punters are now able to bet on keno games online at Lottoland, a lottery betting service that’s taken Australia by storm. We explain more about Lottoland, how this unique betting platform works and how you can use "Kenoland" to partake in online keno games for real money from the comfort of home. 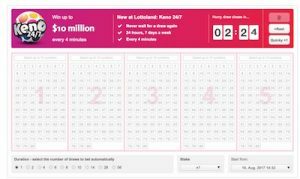 Lottoland is what’s known as a lotto betting service, which is where you bet on the outcome of a lottery instead of buying tickets to the actual lottery draw. You pick numbers just like you would on a lottery ticket and if you pick the winners, you will win the same cash prizes that are up for grabs in the official lottery draw. This form of betting allows Australian punters to take part in lotteries from around the world that you wouldn’t otherwise have access too. Lottoland also offers online keno games that follow this betting process, allowing players to place real money bets on the outcome of local and overseas keno draws, with some huge jackpot prizes up for grabs. Who can bet on keno at Lottoland? 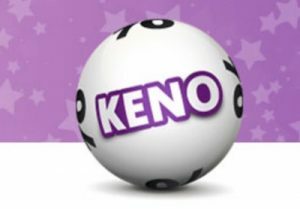 Keno at Lottoland is available to residents of Australia aged 18 years or older. Unfortunately, Lottoland is not available to residents of South Australia. What keno games are available to bet on? Keno 24/7 is the biggest and most popular game of keno offered at Lottoland, with a $10 million jackpot up for grabs every four minutes, every hour of the day. Keno 24/7 is part of the official New York Keno Quick Draw, and all you need to do is pick up to 10 numbers from 1 to 80. Bets start from just $1 and are capped at $10 per draw, with winnings multiplied by the size of your stake. German Keno draws take place daily at 3:10am AEST, with each draw offering a jackpot prize pool of $1,500,000. Players can choose up to 10 numbers from 1 to 70, or you can use the Quicky+1 option to have the computer randomly select numbers for you. Bets start from as little as $1.50, and for an extra $1.15 you can take advantage of the Plus5 bonus game which allows you to bet on a side draw. German Keno has the unique feature of providing wins even when you match no numbers. KeNow gives online players the chance to win a $1 million jackpot every four minutes between 2:34pm and 7:54am AEST – that’s 15 chances to win every single hour. In KeNow, you can bet on as little as one or as many as 10 numbers from one to 70, with 20 numbers then drawn as winners. The more numbers you choose, the higher your potential winnings. For a chance at the million dollar jackpot, you need to select 10 numbers with a stake of x10. Multi Keno draws take place twice per day, with 20 balls drawn from number 1 through 80. Bets start from just $1, but if you choose a higher stake, your bet will be multipler by that amount. Multi Keno draws take place daily at 2:40pm and 8am AEST and have a potential jackpot of $8.7 million when the Plus bet is activated. Once your payment has been processed and your bet is officially placed, all you need to do is wait for the keno draw to take place. You will automatically receive an email informing you if you have been a winner, or you can check the ‘Results & Numbers’ tab from the Lottoland homepage, where all winnings are published shortly after the draw takes place. Be aware that all deposits processed via credit card will be classed as “gambling transactions” by your financial institution, which may be subject to a cash advance fee. You will need to contact your bank to see if they will treat your Lottoland deposit as a cash advance. Apart from this, there are no other fees for using Lottoland’s keno betting service. And loads of others. Check out Lottoland.com.au to see all the lottery draws available, with clear information displayed about the jackpot prize up for grabs and instructions on how to place your bets. Is it safe to bet on keno at Lottoland? Yes, Lottoland is a fully secured and regulated site with licensing from the Government of the Northern Territory under the Racing and Betting Act 1983 (NT). The site is 100% legally allowed to accept real money wagers on a range of global lotto and keno draws and is fully insured against major customer wins. €100 million is set aside in the case that major jackpots are won, ensuring the company has access to funds if you are lucky enough to be a jackpot winner. Lottoland is protected by SSL (secure socket layer) digital encryption security and does not collect any customer data beyond what is required by law. Customers can also set their own spending limits and view their betting history to ensure responsible gambling practices are followed.